Read my review of the LifeProof protection case for iPhone 4/4s here. My original position still stands and I would rather waterproof my phone (using Liquipel) so I can use a battery case. 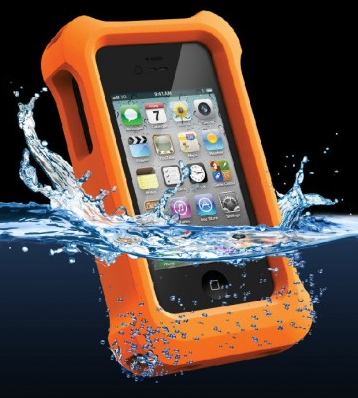 If you own a LifeProof iPhone protective case, you should take a look at their LifeProof Lifejacket. The Lifejacket is a foam based case enhancer that increases the buoyancy of your phone so it doesn’t sink. The bright orange color means it will be very visible even from a fair distance. The foam they use seems to be very resistant and should provide years of use. I tried tearing it with my hands and it stood up very well. Because it is a thick foam, one of the side benefits is that it becomes much more shock resistant. The kit comes with a lanyard and wrist strap. The Lifejacket can put installed and removed with ease and would be a great vacation accessory. The Lifeproof case is still selling for $79.99 (now with free shipping* to a bunch of countries). The Lifejacket sells as an add-on for $39.99. * Free shipping applies for deliveries to the US and Europe. Canada seems to be excluded for the time being.